What a great idea, I’ve got a ton of extra crochet hooks I hardly ever use. I’m making one today! I love that idea! I’m on it! That is such a great idea! I have a bag of notions, and it seems like it’s always in a different WIP bag than the one I happen to have at any given time. Thanks! Awesome idea! Thanks for sharing your creative solution. so damn clever, I can barely stand it! So cool! I’m making one now! 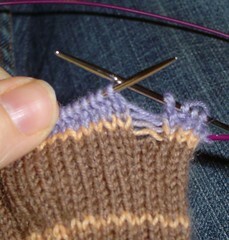 Knitters are always coming up with nifty ways to make the “habit” easier! Way to go. Now where are my pliers? omg, you are a genius! What a fabulous tool. Thanks for sharing! I sound like a broken record, but this is too cool! And I love your photo-illustrations. They’re perfect. Fantabulous! I love that keychain idea! How perfect, considering how I usually forget my box of tools when I travel or go to my knitting group. I can’t wait to try this. Thanks for such detailed directions! What a great idea! I definitely need one. That is the best idea for a keychain I’ve ever seen. Thank you so much for sharing your wonderful idea!! Cool! I am going to make one right away, cuz I am always taking my sock projects with me, they travel so well, and like you, I don’t typically take any notions with me. Thanks for such a great idea. That is so cool! I’m going to make one for sure! Thank you! I am having palpitations! 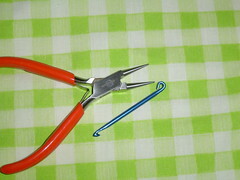 I can\’t tell you how many times I have had to improvise with a paperclip. Now I am joining the ranks of super-pro knitters everywhere. AWESOME! I actually made one and it\’s sooo cool! Thanks for the sweet idea! This is such a wonderful idea. Thanks so much for an item much needed while knitting on-the-go. Why didn\’t I think of this. You are so smart. this is amazing! i found a link to this on noricum\’s blog. it\’s so cool, that i posted a link to it on the daily chum. i hope it\’s ok, but i used your completed project picture to illustrate. thanks! and just you know that word’s getting around, i found you through the daily chum. what a must have item indeed. and i even have the jewelry making tools! I totally love this idea! I have GOT to make one too! Hi. I loved your hook keychain idea so gave it a try this morning. 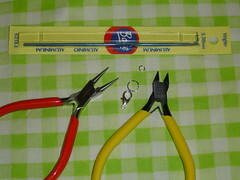 Cutting the hook was easy but I can\\\\\\\’t get the flat end to bend around without breaking off. Could you drop me an email please? I\\\\\\\’d like some advice before I destroy another hook LOL! (the flat end broke off of the 1st attempt). 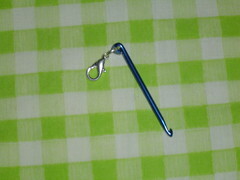 I\\\\\\\’m trying a sz 3mm/D aluminum hook so it is a small one. TIA! I had the same problem as Shell… any helpful tips??? I’m sorry that I don’t have a solution for a hook that breaks. I tried this with an aluminum hook from the japanese dollar store, and it broke on me. I have had success with the Boye aluminum hooks (as pictured). 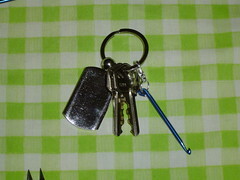 Perhaps all is not lost though… if you have a dremel or similar tool, you could just drill a litte hole in the hook to attach it to you keychain. Sorry and good luck! Wow! I keep a small pouch of notions and was actually about to buy a mini crochet hook to put in there, as it’s only 3.5 inches tall, but this is SO much better! Thank you so much!!! Thank you so much!! I googled “mini crochet hooks” and your tutorial popped up. I want to make these to include in the goody bags for our big crochet event next month. Our members will love them!! 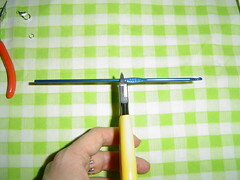 I have been looking for a mini crochet hook as a pendant for my chain because I LOVE to crochet. I would never have thought of a keychain crochet hook. That is a neat idea!! Thanks. Your pictures are excellent. 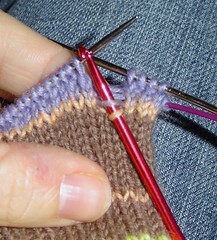 As a fledgling knitter, I was most interested to read about using the hook to pick up dropped stitches! :>) I linked to this on my weekly link roundup (post is under my name). Thanks! Oh my goodness! Just the thing for a stocking stuffer for my mom! I’m making one today! Brilliant. I’m leaving now to make me one… or two.. Saw a wind chime made of knitting needles I would also like to make. THANKS!!! I am definitely making this! Thanks!! I’ve been crocheting since ’83 & have never heard of a “dropped stitch” before. Could you please tell me what that is? Mind you, I taught myself how to crochet & have gotten advice from crochet experts before & no one ever mentioned that to me. I’d appreciate it. Thanks.